Find our shipping, ordering and return policies here. English. Also available in Spanish on request! Please download, read and understand these instructions before ordering. When you buy the hinge kit, you will receive a printed version of these files. We have put these instructions on this site in Adobe PDF format for review, please read them to help decide if this kit is for you. There is one file per page of instructions, and some of these files are pretty large so they might take a few minutes to load on a modem connection. 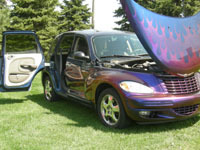 [May 2, 2007] News: Street Dreams By Ross, L.L.C.TM is introducing a new PT Cruiser hood reverse kit. Please click here for more information. [May 22, 2006] News: Information on a new steel spindle / aluminum hub combination has been posted, please click here to see the steel drop spindle / hub kit. [May 22, 2006] News: The photo gallery has more pictures and larger pictures. Please click here to visit the gallery! 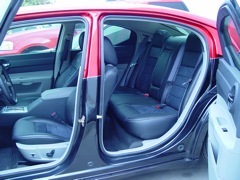 [Nov 8, 2005] News: We have uploaded a photo shoot of an installation of our Extra Large Suicide hinges on the rear doors of a Chrysler 300. Click here for the 300 Installation Gallery. [Nov 7, 2005] News:It has come to our attention over the past few months that some people are selling our instructions on eBay. They are unaffiliated with us and are selling without our permission. We do not sell our printed instructions, we provide them for free on this web site. [July 18, 2005] News: We have updated the web site with improved products and improved descriptions and pictures. [January 7, 2005] News: We are now introducing a hood reversing kit! Click here to see the hood reverse kit! [July 29, 2005] News: The old site at iserv.net is going away. Please make sure that your bookmarks link to the streetdreamsbyross.com site. The email address is now sales (at) streetdreamsbyross (dot) com. [November 29, 2004] News: We are now switching to a new server! Please be sure to update your bookmarks. http://www.streetdreamsbyross.com/ The old page at iserv.net will be there for a few months yet. [October 29, 2004] News: We will be in Las Vegas, NV for the SEMA convention from October 31 to November 7, and as such, will be closed for that week. We will still be checking our email and possibly check our phone messages while at SEMA. [January 27, 2004] News: We are entering the testing phase of our aluminum drop knuckles / hub brake upgrade system for the '84-'87 Fiero. It allows the use of beefier bearings, vented rotors, a choice of four different wheel bolt patterns and upgraded brakes. We are also considering our options for the '88 models as well. If you are interested, please contact us. [August 26, 2003] News: If you have sent an email to us and you didn't get a response within one or two business days, please resend it. Our email system was deluged with large virus containing emails, so some emails may have been lost in a shuffle. Street Dreams By Ross, L.L.C.TM has not been infected with this virus. Our tips: buy an anti-virus program and keep it updated. Never open suspicious emails and never open suspicious attachments, even if it may be from someone you know, that is one trick a virus can use to get people to infect their computer. If you believe your computer is infected, disconnect its internet cable and have the computer checked to prevent its spread. [April 16, 2003] News: Some people have contacted us with problems they have with their CDs. The problem is that Street Dreams By Ross, L.L.C.TM does not produce, distribute, sell or give away CDs. If you bought a CD, you bought it from someone else, so if you have any problems with it, please contact that seller. Last updated July 18, 2005.